The best way to find out more about who we are and what we’re like is to come along on a Sunday! 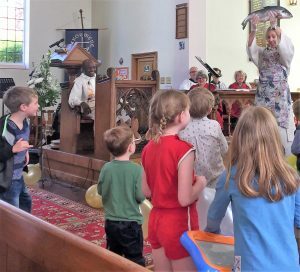 In a nutshell… We’re part of the Church of England – which means we’re committed to serving our local area; we’re part of the Diocese of Southwark, and we belong to an international community of Anglican Christians. As a parish church we’re here for everyone, and we hope that everyone feels welcome to use our buildings, to come to our services, and to get involved in the things we do. Our churches have been in this area since 1871, and we continue to value our heritage and traditions, whilst finding new ways to make our church meaningful and engaging for the people who live here today. We are also a ‘Fairtrade Church’ – committed to using fairtrade tea, coffee, sugar and Communion wine. We have a fairtrade stall in church twice a month, and for the last few years we’ve marked Fairtrade fortnight with a fairtrade wine tasting! Follow the links to find out more about our vision, some of our people, our history and our partnerships.